The documentation Portal, at help.acumatica.com, has been updated with the current 2018 R1 documentation, including Release Notes. Distinguish companies from branches. Acumatica lets you define separate legal entities with independent balance sheets and separate tax reporting requirements. Track financials for organizations and subsidiaries requiring inter-company accounting, with the ability to distinguish companies from branches and departments. Divide transactions to various accounts or branches during reclassification. Acumatica now allows you to split transaction amounts to transfer portions to other accounts, subaccounts, or branches. Flexible opportunity quote tracking. Acumatica lets users create multiple quotes for a single opportunity. Once the customer accepts an offer, a sales order and invoice can be created based on the quote. Improve project management by controlling changes to the project scope, including customer and internal requests. Create a change order with all the documentation, including the revenue budget, cost budget, commitments, and class. Define your workflows and approval processes, and release change orders with full business intelligence visibility and audit trail control. Both progress billing and pro forma invoices were introduced in 2017R2, and in this release both have been enhanced to support time and material, tasks, cost codes, and retainage for the construction industry. Define the services that will be covered in the billing period with the number of appointments or hours, the standard fees, and the overage prices. At the end of each defined billing period, the customer will receive an invoice that includes the covered amount plus the overage amount. Aids in keeping track of the work being performed by staff using the location capabilities of mobile devices to accurately track the GPS location on Bing Maps in real time. From that, a dispatcher can schedule the closest available vehicle for high priority service calls. Get IDC’s perspective on how Acumatica 2018 R1 can benefit you. The Construction Edition was announced and demonstrated in January at IBS (International Builders Show) and WOC (World of Concrete). It provided proof that Acumatica Construction Edition will help manage specific business management needs for both residential and commercial contractors, including project costing, retainage, and compliance. Based on the three pillars of true cloud, real-time, and high value, Acumatica Construction Edition will give contractors a modern system – accessible through any mobile device – to handle every project accurately and cost-effectively. Today’s construction companies require advanced financials and SaaS technology to meet management needs to remain competitive. For more information please visit Acumatica Construction Edition. Many firms have distribution requirements, including retailers, manufacturers, service providers, and wholesale distributors. The distribution processes are a critical function in their overall supply chain management. 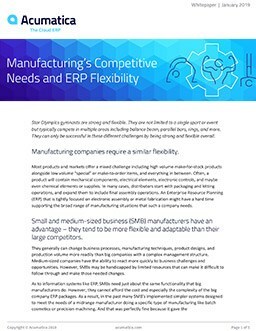 They need Integrated Financials and Inventory with robust ERP functionality. Distribution Edition includes Advanced Financials, Advanced Inventory, Sales Order Management, Requisition Management, Purchase Order Management, Advanced Fulfillment, and supports up to 10 entities at bundled pricing. The full range of modules are available as optional add-ons. Add stock items directly to an invoice and update inventory—without creating a sales order or return. Process an order in one click. Acumatica performs standard order processing steps automatically—and keeps you updated on every step through completion. For more information please visit Acumatica Distribution Edition. Also new in 2018 R1 is Drill-down dashboard filters. Acumatica now provides finer granularity to your dashboards by allowing users to filter on specific parameters to display dashboard data for a limited range of data, for example, sort leads by owner or sales by product or branch. For more information please visit Business Intelligence.